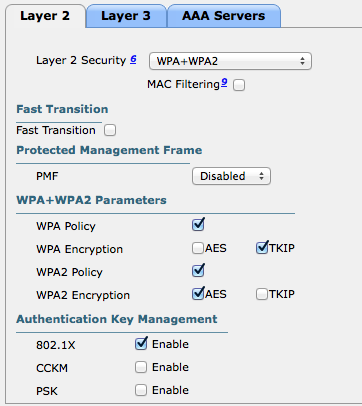 Is a good move, but I question why Cisco is just changing this while they leave a laundry list of default settings in values that are dated and recommended that you change on initial install? Great commentary Sam. I agree Wirednot, at least its a step in the right direction. Darn those TKIP devices!! Reblogged this on Fire my Wires. Thank you Sam! This could affect some legacy clients and will definitely require lab testing. 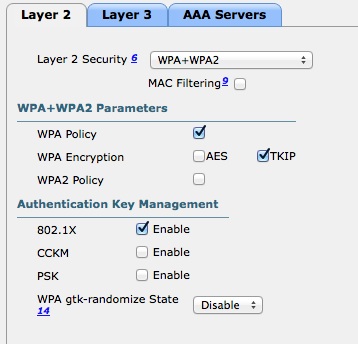 Enabling both WPA/TKIP and WPA2/AES on the same WLAN is contrary to what Cisco has been recommended thus far. Is there an ETA for the release of this code? I’m sorry, but I was only approved to share this specific information.